Productions: Octave Feuillet, Le Village, Comédie-Française, Paris, 187? Text: Whence, it may be asked, does the society derive its light and its inspiration? From the past, from precedent, from tradition—from the great unwritten body of laws which no one has in his keeping but many have in their memory, and all in their respect. 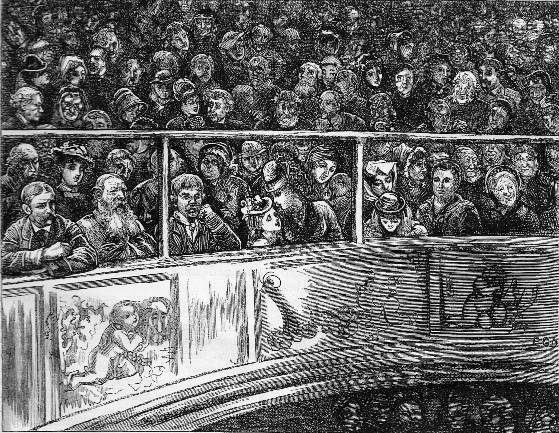 The principles on which the Théâtre Français rests are a good deal like the Common Law of England—a vaguely and inconveniently registered mass of regulations which time and occasion have welded together and from which the recurring occasion can usually manage to extract the rightful precedent. Napoleon I., who had a finger in every pie in his dominion, found time during his brief and disastrous occupation of Moscow to send down a decree remodelling and regulating the constitution of the theatre. This document has long been a dead letter, and the society abides by its older traditions. The traditions of the Comédie-Française—that is the sovereign word, and that is the charm of the place—the charm that one never ceases to feel, however often one may sit beneath the classic, dusky dome. One feels this charm with peculiar intensity as a newly arrived foreigner. The Théâtre Français has had the good fortune to be able to allow its traditions to accumulate. They have been preserved, transmitted, respected, cherished, until at last they form the very atmosphere, the vital air, of the establishment. A stranger feels their superior influence the first time he sees the great curtain go up; he feels that he is in a theatre that is not as other theatres are. It is not only better, it is different. It has a peculiar perfection—something consecrated, historical, academic. This impression is delicious, and he watches the performance in a sort of tranquil ecstasy. Never has he seen anything so smooth and harmonious, so artistic and complete. He has heard all his life of attention to detail, and now, for the first time, he sees something that deserves the name. He sees dramatic effort refined to a point with which the English stage is unacquainted. He sees that there are no limits to possible “finish,” and that so trivial an act as taking a letter from a servant or placing one’s hat on a chair may be made a suggestive and interesting incident.He sees these things and a great many more besides, but at first he does not analyse them; he gives himself up to sympathetic contemplation. He is in an ideal and exemplary world—a world that has managed to attain all the felicities that the world we live in misses. The people do the things that we should like to do; they are gifted as we should like to be; they have mastered the accomplishments that we have had to give up. The women are not all beautiful—decidedly not, indeed—but they are graceful, agreeable, sympathetic, ladylike; they have the best manners possible and they are delightfully well dressed. They have charming musical voices and they speak with irreproachable purity and sweetness; they walk with the most elegant grace and when they sit it is a pleasure to see their attitudes. They go out and come in, they pass across the stage, they talk, and laugh, and cry, they deliver long tirades or remain statuesquely mute; they are tender or tragic, they are comic or conventional; and through it all you never observe an awkwardness, a roughness, an accident, a crude spot, a false note. As for the men, they are not handsome either; it must be confessed, indeed, that at the present hour manly beauty is but scantily represented at the Théâtre Français. Bressant, I believe, used to be thought handsome; but Bressant has retired, and among the gentlemen of the troupe I can think of no one but M. Mounet-Sully who may be positively commended for his fine person. But M. Mounet-Sully is, from the scenic point of view, an Adonis of the first magnitude. To be handsome, however, is for an actor one of the last necessities; and these gentlemen are mostly handsome enough. They look perfectly what they are intended to look, and in cases where it is proposed that they shall seem handsome, they usually succeed. They are as well mannered and as well dressed as their fairer comrades and their voices are no less agreeable and effective. They represent gentlemen and they produce the illusion. In this endeavour they deserve even greater credit than the actresses, for in modern comedy, of which the repertory of the Théâtre Français is largely composed, they have nothing in the way of costume to help to carry it off. Half-a-dozen ugly men, in the periodic coat and trousers and stove-pipe hat, with blue chins and false moustaches, strutting before the footlights, and pretending to be interesting, romantic, pathetic, heroic, certainly play a perilous game. At every turn they suggest prosaic things and the usual liability to awkwardness is meantime increased a thousand fold. But the comedians of the Théâtre Français are never awkward, and when it is necessary they solve triumphantly the problem of being at once realistic to the eye and romantic to the imagination. I am speaking always of one’s first impression of them. There are spots on the sun, and you discover after a while that there are little irregularities at the Théâtre Français. But the acting is so incomparably better than any that you have seen that criticism for a long time is content to lie dormant. I shall never forget how at first I was under the charm. I liked the very incommodities of the place; I am not sure that I did not find a certain mystic salubrity in the bad ventilation. The Théâtre Français, it is known, gives you a good deal for your money. The performance, which rarely ends before midnight, and sometimes transgresses it, frequently begins by seven o’clock. The first hour or two is occupied by secondary performers; but not for the world at this time would I have missed the first rising of the curtain. No dinner could be too hastily swallowed to enable me to see, for instance, Madame Nathalie in Octave Feuillet’s charming little comedy of “Le Village.” Madame Nathalie was a plain, stout old woman, who did the mothers and aunts and elderly wives; I use the past tense because she retired from the stage a year ago, leaving a most conspicuous vacancy. She was an admirable actress and a perfect mistress of laughter and tears. In “Le Village” she played an old provincial bourgeoise whose husband takes it into his head, one winter night, to start on the tour of Europe with a roving bachelor friend, who has dropped down on him at supper-time, after the lapse of years, and has gossiped him into momentary discontent with his fireside existence. My pleasure was in Madame Nathalie’s figure when she came in dressed to go out to vespers across the place. The two foolish old cronies are over their wine, talking of the beauty of the women on the Ionian coast; you hear the church-bell in the distance. It was the quiet felicity of the old lady’s dress that used to charm me; the Comédie-Française was in every fold of it. She wore a large black silk mantilla, of a peculiar cut, which looked as if she had just taken it tenderly out of some old wardrobe where it lay folded in lavender, and a large dark bonnet, adorned with handsome black silk loops and bows. Her big pale face had a softly frightened look, and in her hand she carried her neatly kept breviary. The extreme suggestiveness, and yet the taste and temperance of this costume, seemed to me inimitable; the bonnet alone, with its handsome, decent, virtuous bows, was worth coming to see. It expressed all the rest, and you saw the excellent, pious woman go pick her steps churchward among the puddles, while Jeannette, the cook, in a high white cap, marched before her in sabots with a lantern. Such matters are trifles, but they are representative trifles, and they are not the only ones that I remember. It used to please me, when I had squeezed into my stall—the stalls at the Français are extremely uncomfortable—to remember of how great a history the large, dim salle around me could boast; how many great things had happened there; how the air was thick with associations. Even if I had never seen Rachel, it was something of a consolation to think that those very footlights had illumined her finest moments and that the echoes of her mighty voice were sleeping in that dingy dome. From this to musing upon the “traditions” of the place, of which I spoke just now, was of course but a step. How were they kept? by whom, and where? Who trims the undying lamp and guards the accumulated treasure? I never found out—by sitting in the stalls; and very soon I ceased to care to know. One may be very fond of the stage and yet care little for the green-room; just as one may be very fond of pictures and books and yet be no frequenter of studios and authors’ dens. They might pass on the torch as they would behind the scenes; so long as during my time they did not let it drop I made up my mind to be satisfied. And that one could depend upon their not letting it drop became a part of the customary comfort of Parisian life. It became certain that the “traditions” were not mere catchwords, but a most beneficent reality. Comments: Henry James (1843-1916) was an American novelist and critic. 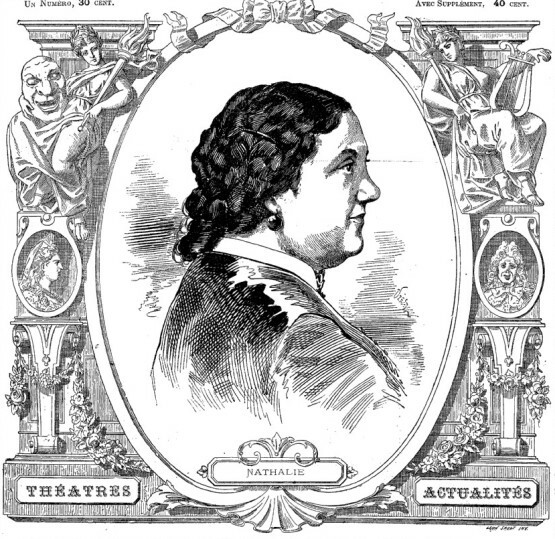 The above is an extract from a long essay on the Théâtre-Français, or Comédie-Française, which was and remains one the leading Parisian theatres. The actors mentioned are Jean Baptiste Prosper Bressant, Jean Mounet-Sully, Zaïre-Nathalie Martel (Mademoiselle Nathalie) and Rachel Félix (Mademoiselle Rachel).